You don’t need to schedule a long, luxurious vacation away in order to reap the benefits of travel. Sometimes, just a quick road trip or flight to a new destination is all you need to rest, recharge, and inspire yourself. Waking up in an unfamiliar location and exploring unfamiliar streets is a great way to shake off the drudgery of routine. So when you find that new route, inexpensive flight, or a great deal on an Airbnb, pack a weekend bag and hit the road! Below are the six best weekender bags for overnight travel. No need to haul around giant pieces of luggage for just an overnight. Instead, throw some essentials into one of the pieces below and you will be out the door before you know it! A duffle bag is a classic choice for any road trip or camping get away. They are easy to pack, sturdy, and provide just enough space without inviting you to pack your whole life. They aren’t great for trips with a lot of walking since few come with wheels and fewer still with backpack straps. But if you are planning a quick car trip or a camping trip at a site that is easy to access, throw your essentials in here and plop it down in your overnight location. The canvas material of this bag is rugged and tough. It zips closed and has two handles for your hands and an over-the-shoulder strap. There is even a separate compartment that you can store your shoes in. This is a particularly nice feature for camping since it saves the rest of your items from getting dirty. These features are why it is a great bag for a quick overnight away. If you plan on spending the weekend hiking, or if you just prefer to haul around your belongings on your back, then this Luxur backpack is the perfect weekender choice for you. In fact, this bag is incredibly versatile. It can be worn as a backpack, carried like a duffle, or even slung over your shoulder like a satchel. The main compartment is large and easy to access, and the front of the bag contains a hidden zippered pocket which is great for holding valuables and essential travel documents. It has a rustic, outdoorsy look, but is still stylish enough to bring into 5-star hotels. The shoulder straps are padded and adjustable for comfort. The back panel is mesh which will help to keep you cool during hiking adventures. 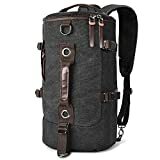 This is a great bag for anyone who doesn’t want to deal with duffels or wheels, but who still wants something stylish to carry their over-night belongings in. 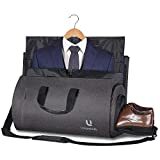 If you are going to a nice event during your weekend away – maybe a wedding, a work party, or a significant dinner – this duffle bag is a great choice for you. It has a built-in garment bag which will keep your formal attire well-packed and wrinkle-free. Plus, it has a separate shoe compartment which will keep your dirty shoes out of contact with your nice clothes and accessories. It is made of scratch and waterproof fabric, which is fantastic since any avid traveler knows that unexpected jostlings and accidents happen all the time during transit. It has an adjustable and removable shoulder strap, or can easily be placed on top of a larger piece of luggage. Next time you are headed somewhere nice, leave the steamer at home and don’t worry about wrestling with the hotel’s iron. Pack your formal wear in this overnight duffel and be on your way! If duffel bags just aren’t your style, and if you really won’t need a lot of clothes or accessories for your overnight, then invest in this travel tote bag. It is small enough to fit under the seat in front of you during your flight, or comfortably on the seat beside you for a car trip. The classic tote design will never go out of style, but the leather details on this piece really elevate it into something elegant. The top zips closed, which is an important travel feature. There is a detachable shoulder strap you can use if you want to sling the whole thing over your shoulder instead of using the handles. It can easily be transported atop a larger piece of wheeled luggage, or it can easily be used on its own for a quick night away. This weekender bag comes in three neutral colors, so anyone can wear it and look good. It is an all-around great choice for a quick, low-maintenance get away. If you are looking forward to more of an adventure-focused weekend, skip the stylish duffels and shoulder bags. Instead, opt for this lightweight, high capacity day pack. This incredibly versatile pack consists of one main compartment that you can access by a zipper that reaches halfway down the front of the bag. There is also a compartment for delicate items or things that you will need quick access to. Plus, there is a front zipper pocket for anything else that is small and compact. It has padded shoulder straps and two water bottle sleeves. This weekender bag comes in seven colors – ranging from neutral and understated to bright and neon. If you are going to be hiking, camping, or generally doing something outdoorsy, this backpack is a great overnight choice for you! If you aren’t a fan of carrying your luggage, invest in this petite Samsonite bag for your overnight trips. It is compact, efficient, and small enough to fit under the seat in front of you. 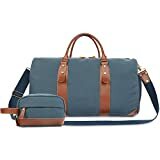 It is perfect for anyone who prefers to wheel their luggage instead of carrying it, but doesn’t want to bring a standard carryon-sized bag for a quick overnight trip. Samsonite is a trusted travel brand that takes traveler’s needs into consideration. The bag consists of the main zipper compartment, a side compartment, and a front compartment for chargers and vital travel docs. The handle is retractable. Plus, there are two hand straps on the top of the bag that gives you the option to carry. This is a great choice for anyone flying budget airlines for their quick weekend trips.